and (4) .38 caliber Iver Johnson Arms and Cycle gun. (Peoria County Sheriff’s Office May 26, 1970 Report). That same day, Officer Robert Cone of the Peoria Police Department flew to Washington, D.C. and personally delivered these items of evidence to the F.B.I. for analysis, including a fingerprint analysis. (Id.). Willard M. Koeppel, then Sheriff of Peoria County, specifically asked the FBI to “Compare fingerprints of Heidenberg, F.B.I. 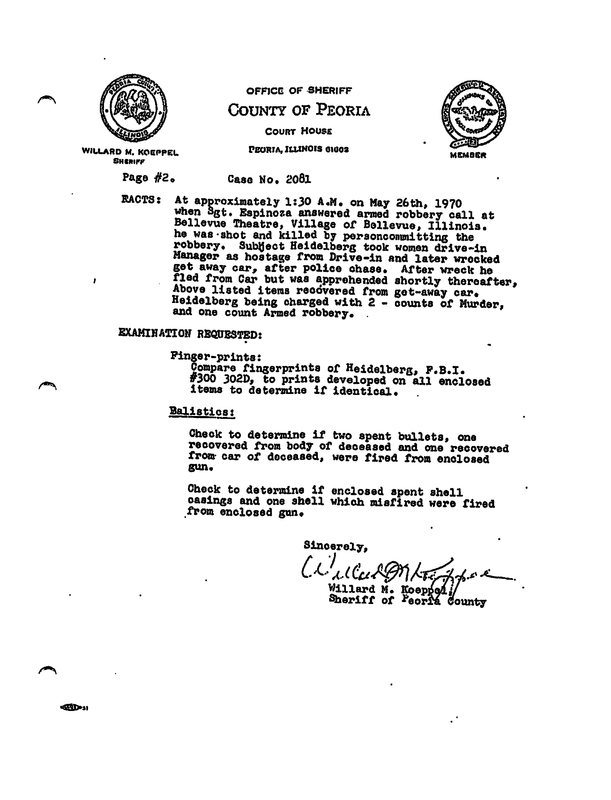 #300 303D, to prints developed on all enclosed items to determine if identical.” (Peoria County Sheriff letter to FBI dated May 26, 1970). On June 5, 1970, the FBI reported to Sheriff Koeppel that “No latent prints of value appear or were developed on the specimens.” (FBI Letter dated June 5, 1970). The FBI further stated “The disposition of all the submitted items and the results of the laboratory examinations are the subjects of a separate report.” (Id.) (Emphasis added). 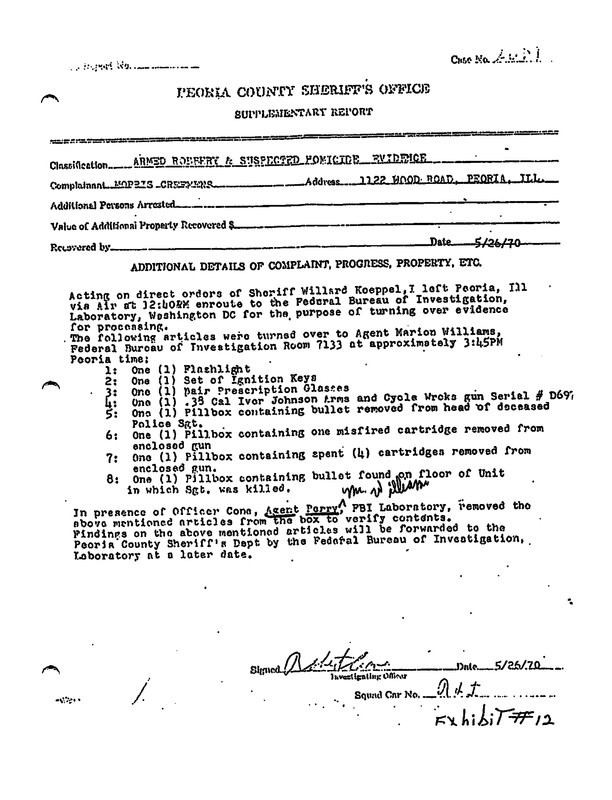 On June 19, 1970, the FBI sent a ballistics report to Sheriff Koeppel. 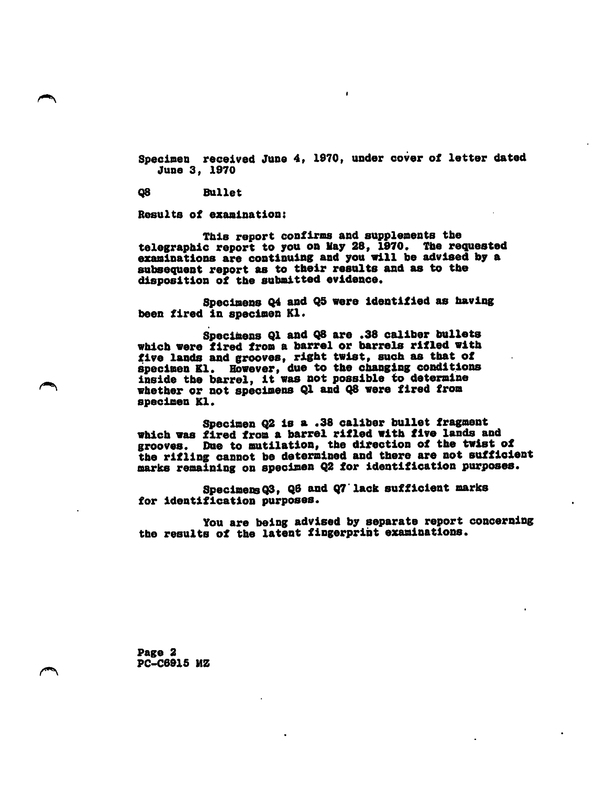 That report stated “You are being advised by separate report concerning the results of the latent fingerprint examinations.” (FBI Ballistics Report dated June 19, 1970, Report page 2) (Emphasis added). These FBI communications leave no doubt that the FBI prepared a report (and perhaps more that one report) concerning the results of the latent fingerprint examinations. Mr. Hamm: If the court pleases, the Defendant’s – not to interrupt Mr. Riddle – but Mr. Riddle raised the point that the Defendant’s attorneys have had copies of all police reports, all witness statements, all FBI information, and have had the same opportunity, as far as that is concerned, to glean a list of witnesses from these reports. (emphasis added). However, Mr. Hamm’s representation was not true. The State had not produced to Mr. Heidelberg any FBI latent fingerprint report, despite knowing that the FBI had completed a latent fingerprint report. Defendant: It is also my knowledge and belief that the State’s Attorney has a final communique concerning latent fingerprints, a report from the F.B.I office. I believe he has this in his possession and not produced it. The Court: Mr. Hamm, if you have it, if your office had it would you not have it? The Court: Do you have it? The Court: Never mind. Mr. Hamm is also under oath when he stands before this court. Now, what’s next? Defendant: Your Honor, I would like to go back to the allegation I made that all records, transcripts, reports, statements, memorandums, notations prepared by the F.B.I or other Federal agencies, I would like to say that the State’s Attorney I believe has in his possession communiques from the F.B.I. concerning latent fingerprints. The Court: The court has already ruled on the basis of their representation that is not true. Next matter. And of course Mr. Hamm you would be prepared to take the consequence if that is not the truth? Mr. Hamm: That is correct, your Honor. 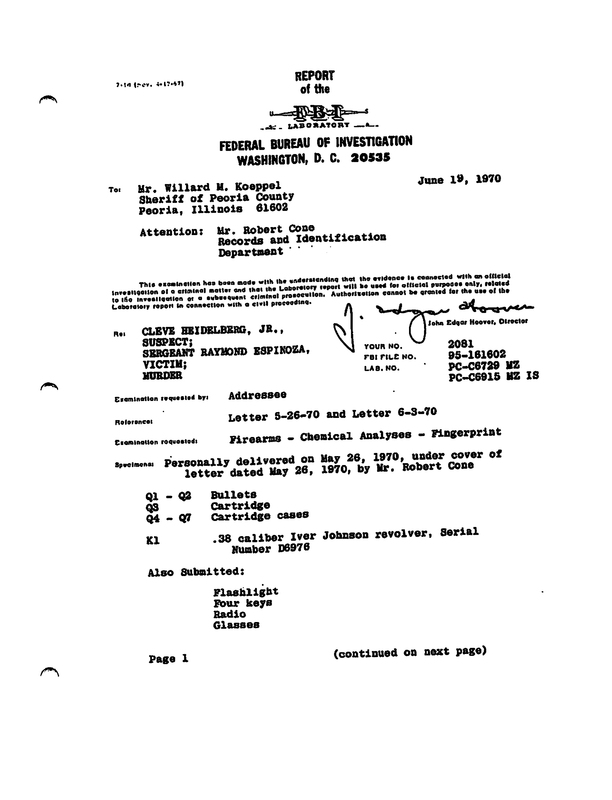 At the time Mr. Heidelberg requested that the State produce all FBI latent fingerprint reports, the State knew, based on the FBI’s June 5, 1970 letter and the FBI’s June 19, 1970 report that the FBI had indeed prepared a latent fingerprint report. Yet, the state represented to the court that it had no such report in its possession. That may have technically been true. But, the question is why didn’t the State have a copy of the latent fingerprint report in it’s possession? Did the Peoria County Sheriff advise the FBI not to send them the latent fingerprint report because it was not helpful? Further, it is not known at this time whether the FBI found someone else’s fingerprints on the submitted evidence and, in particular, the murder weapon. We do know that the Peoria County Sheriff specifically asked the FBI to compare Mr. Heidelberg’s fingerprints to any fingerprints from the submitted evidence. 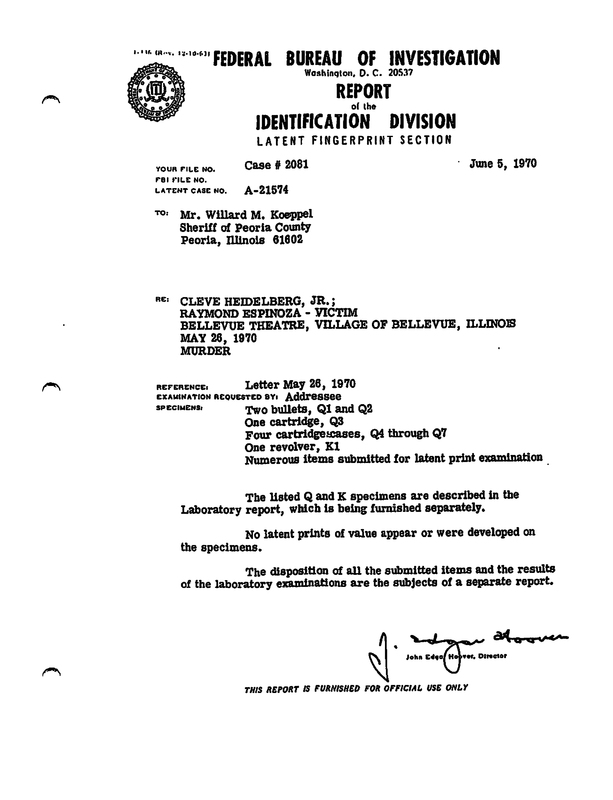 The FBI’s initial response, on June 5, 1970, was that “No latent prints of value appear or were developed on the specimens.” (Emphasis added). It is unclear what that meant. If this was simply a case where there were no suitable prints found for comparison, there would be no reason that the FBI would not have submitted such a report to the Peoria County Sheriff who, in turn, would and should have produced that report to Mr. Heidelberg and his attorneys. 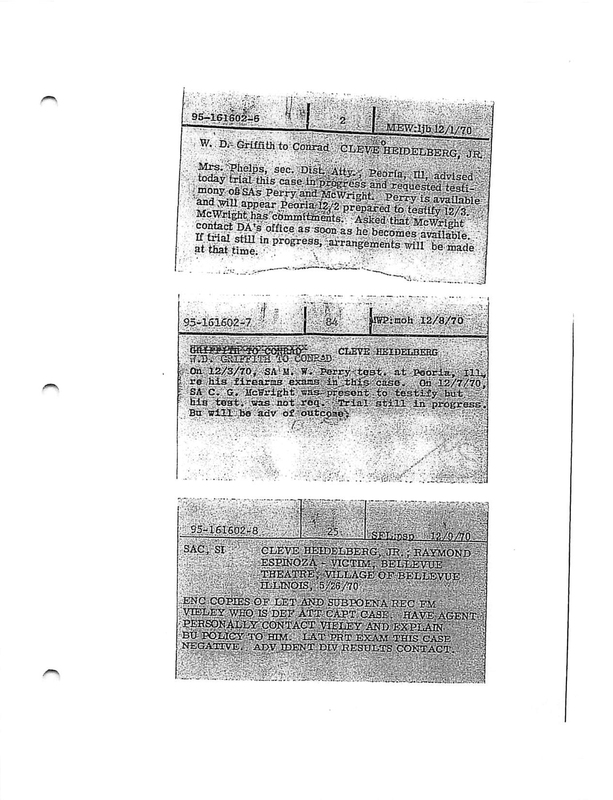 However, and FBI index card dated December 9, 1970 states “LAT PRT EXAM THIS CASE NEGATIVE.” (FBI Index Card). The word “negative” when viewed in the context of asking the FBI to compare Mr. Heidelberg’s fingerprints to the fingerprints found on the submitted evidence leads to a reasonable conclusion that someone else’s prints may have been found on the submitted evidence.